-who threw some pretty blatant microaggressions towards our heroine and who was the first life Ms. Marvel saved. Here we have her admitting how she was motivated by her insecurities, and that she wants to be better. Kamala admits that it’s been “the most super-intense day” of her life, but I guess that goes hand in hand with people thinking/knowing their existence is coming to a halt. Then, of course, there’s Bruno. 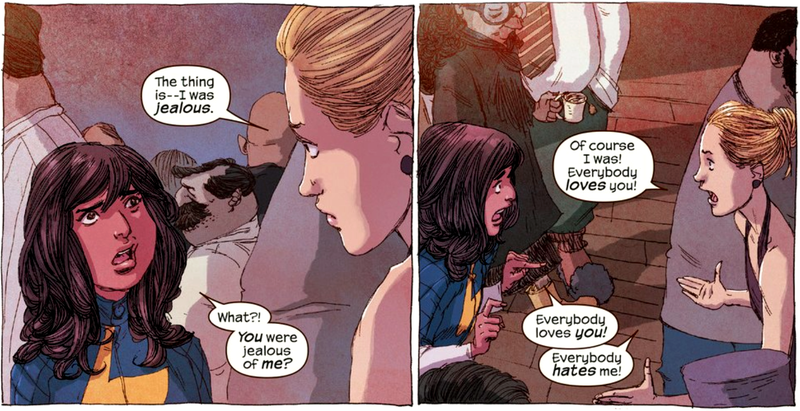 Poor, sweet Bruno, an Alfred of sorts to Kamala’s Batman. Or an Oracle to her Batman. Or the Harold to her Batman. The point is that she’s Batman and he’s supported her from the beginning, as well as harboured some pretty serious unrequited[?] feelings. On the top of Coles Academic High School the two have a heart-to-heart and it’s . . . it’s not what you’d expect. If pressed I would probably describe Ms. Marvel as being a book skewed towards a younger audience, going as low as ten-years-old and up. It’s keeping that in mind that makes reading these two teenagers discuss their relationship that much more shocking. It’s arguably one of the most adult, mature discussions about the subject I’ve ever read in the medium and that’s a lot considering it kicks off with two high schoolers saying the “L-word” to each other. “I’m not ready to be anything else, to anyone else. I need to give this everything I’ve got.” Bruno is someone that Kamala wants to be with, romantically, but she has bigger responsibilities on her plate. She’s a superhero. It may be a wait of three months, give or take, until we see Kamala’s solo title return, but when she does you can guarantee that it will be surrounded by people she loves and who love her back, and that Jersey City can only get better and better having her around. To tack on just one last paragraph, I’ve barely even skimmed the sheer number of gems in this issue, from the all-time high for words/terms that need translating , a sharp reminder of the specific cultural story being told, to the joy and positivity in their decision to meet the end with an enormous dance party. If you haven’t read this book, seriously, do something about that. The Ms. Marvel Visual Gag You Shouldn’t Have Missed: Honestly, the entire artistic team was on point this issue, with kudos going out to colourist Ian Herring in particular. Spotted in the gymnatorium’s designated non-denominational, nonjudgmental prayer area” [yet another gem] is this guy right here. His book says . . . something about baseball? “Baseball Homers“? Either way, don’t judge him. To each their own at the end of the world and otherwise. So that’s that, the first 19 issues of Ms. Marvel reviewed, the first nineteen issues of the world’s first-ever Muslim Pakistani-American superheroine book. It’s been well over a year since Issue #1 dropped and now, with Volume 3 wrapping up, I think it’s probably for the best that I move on. Come next month I will still be buying Ms. Marvel, but will no longer be reviewing it. I do, however, plan on reviewing another book starting from #1, preferably another Marvel comic given my buying habits. Stay tuned to find out what it is! Also, for anyone wondering how to get their Kamala Khan fix, as mentioned Ms. Marvel #1 drops in November with both Takeshi Miyazawa and Adrian Alphona on art [Wilson remaining as writer]. 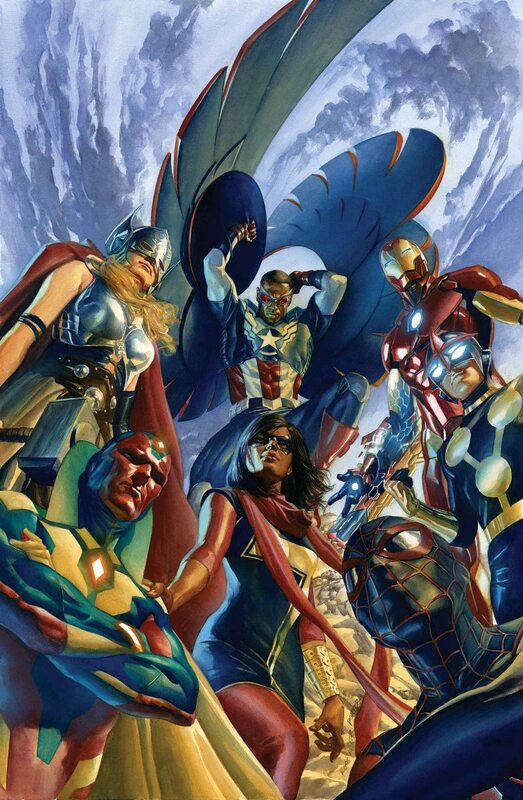 Alongside that is All-New, All-Different Avengers #1 which stars Ms. Marvel alongside some of Earth’s Mightiest Heroes. Mark Waid is on storytelling duties and given how well he’s doing on Archie he knows how to handle teenage characters. If you’ve been waiting for the opportunity to get even more of Kamala’s adventures month in and month out your opportunity is just around the corner. This entry was posted in art, comics, relationships, review, writing, Youth and tagged 19, Aamir, Adrian Alphona, All-New All-Different Avengers, art, brother, Bruno, character, comics, end of the world, family, G. Willow Wilson, Ian Herring, Joe Caramagna, Kamala Khan, Last Days, Marvel, Ms. Marvel, relationships, review, Sana Amanat, Secret Wars, Urdu, Zoe. Bookmark the permalink.